The Protection of Life during Pregnancy Bill has passed the second stage of the Dáil this evening with cross-party support but also cross-party opposition. THE LANDMARK LEGISLATION that will permit abortion in Ireland in limited circumstances has passed the second stage of the Dáil this evening and will now move to committee stage where amendments to it are expected. 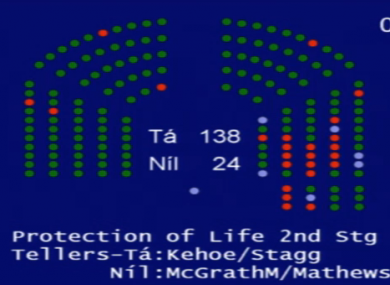 The Protection of Life during Pregnancy Bill passed a Dáil vote this evening by 138 votes to 24 with cross-party support and cross-party opposition. Thirteen Fianna Fáil TDs voted against the bill – they were the only party allowed a free vote. Meanwhile, four Fine Gael TDs voted against it, which means the quartet face expulsion from the parliamentary party as a result. Just one Sinn Féin TD voted against the bill, Peadar Tóibín, who had previously voiced the fact he did not support the bill. In total, six independents opposed the bill. The legislation will now go before the Health Committee tomorrow morning where members will be able to table amendments, 89 of which were published today, before the bill returns to the Dáil at some stage next week. The legislation is expected to be debated in the Seanad later this month. Email “Abortion bill passes first Dáil vote, moves to committee stage ”. Feedback on “Abortion bill passes first Dáil vote, moves to committee stage ”.